The ticket-taker wears a black tuxedo with red silk cummerbund. He has a ruddy face and his body is round and broad like a bear. He tears our tickets gruffly, exactly how I expect a German would tear tickets. I don’t know why I think that, but I do. It could be too much television. I see him curl his fat pink lips into a Wuh. Wilkommen. My sister and I have been in Berlin for three days and I’ve come to find Wilkommen comforting: foreign yet familiar. The ringing upward sound of the Wil heralds the start of the greeting, and kommen rolls down softly after. Wilkommen often sounds to me like the tinkling bell on a beauty-salon door. I wait for the word, watch for it, but the ticket-taker closes his mouth. He looks at me strangely, sweetly, then purses his lips and kisses the tickets loudly. He presses the saliva-covered tickets firmly into my palm, and smiles. He emits a long string of German phonemes that I do not understand and stretches his arms wide, a circus-master flourish, motioning us to walk through the door. It is such a funny, meaningless scene, one of many, like looking at a movie sequence on the cutting-room floor, seemingly unconnected to my own personal narrative. Still, on the playback I sometimes wonder, had I spoken German, would we have exchanged pleasantries? Wilkommen in Clärchens Ballhaus. Vielen Dank, gute Nacht. We said nothing. His spit was in my hand. The torn tickets are still in my purse zipper pocket, the edges curled from his saliva. Could I have bridged that language barrier or was my interaction even more vivid, forced into my imagination? This scene came back to me abruptly when reading Christian Hawkey’s Ventrakl, a brilliant book that is part prose, part poetry, part biography, and part photographic essay. Loosely speaking, Ventrakl is a conversation between two real-life writers, one living and one dead. Living is the poet, Hawkey, and dead is Georg Trakl, an Austrian poet who has been called one of the forebears of German Expressionism. Hawkey’s preoccupation here is with the very nature of translation, which he thinks of not as a retelling of story but as “a conversation or dialogue—and this means one is already entering a constructed, communal space.” Hawkey’s translations do not adhere strictly to Trakl’s text nor are his “interviews” taken from any recording device, but a richer atmosphere is achieved through homophonic translations, photographic analysis, and even white space. Hawkey gives life to the world between himself and Trakl and the relationship between literature and living. It is the viewer, then, who looks back, who must translate the photograph against itself, translate time against itself, put the image back in time, back into a century, a country, a culture, back into the camera, the lens, the moment the shutter clicked and the location of the shutter when it clicked. There is nothing special about this photograph. The same night I met the ticket-taker I danced for hours in Clarchen Ballhaus. Around two in the morning, exhausted and happy from spinning, I saw him chatting with a waiter at the door. I only paused a moment to look and he did not look back this time. He remains that photograph for me. 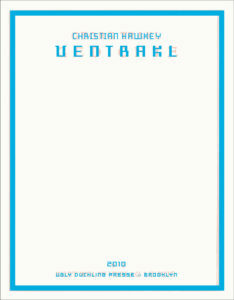 Cassie Hay’s review of Ventrakl first appeared in TLR’s Fall 2010 issue, Refrigerator Mothers.